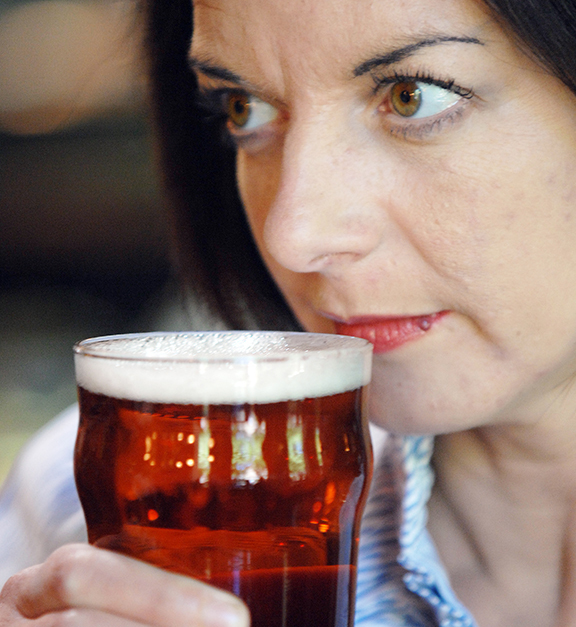 Annabel Smith has worked in the beer industry in one form or another for over 25 years. As an impoverished graduate, she started her love of beer by serving pints in a traditional cask ale house and grew to love the versatility, sociability and diversity of beer. After 12 years of serving beer in pubs all over the UK, she branched out, and was employed by Guinness. She trained over 35,000 publicans worldwide how to pour the perfect pint of the Black Stuff. Her love of all things beer continued and she spotted a job for a fledgling organization called Cask Marque who required a beer taster and a training manager. During Annabel’s 10 years with Cask Marque she designed numerous training courses, tested thousands of samples of beer, and raised the awareness and love of cask beer through a relentless media campaign. This has included qualifying as one of the UK’s first Beer Sommeliers. She is a founder member of Dea Latis, a group formed to change women’s perceptions about beer and encourage more women to consider beer as a drink of choice. Annabel is a member of the British Guild of Beer Writers, and sits on steering committees within the beer industry to advise how to raise the quality and perception of beer. She is also an ambassador for the ‘There’s a Beer for That’ campaign. Annabel is now a freelance Beer Sommelier and is employed as a writer, consultant, trainer and public speaker to both the beer industry and consumers, under her company name BeerBelle. Her current clients include Miller Brands UK, Carlsberg UK, Heineken UK, Molson Coors, Enterprise Inns, Timothy Taylors, Daniel Thwaites and Mitchells and Butlers. She appears as a regular speaker at the BBC Good Food Show and the Ideal Home Exhibition and has a regular weekly column in the Daily Telegraph writing about beer and food pairing. Annabel has a particular passion for engaging females and non beer drinkers to ‘rethink’ how they perceive beer. This is achieved through events, media features and broadcasting. In 2017, Annabel won the Imbibe Educator of the Year Award.